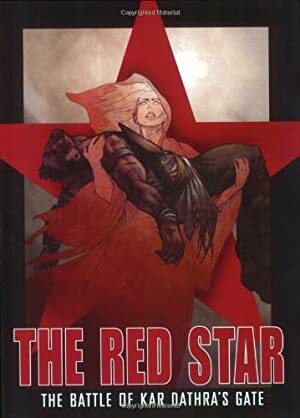 Urik is one of the core characters in the particularly cool comic books series The Red Star, which started in 2000. 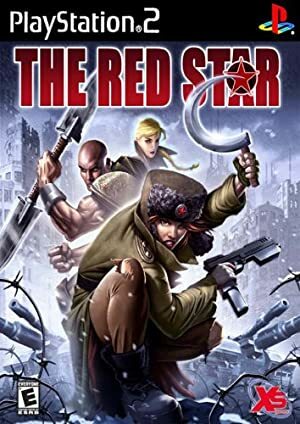 The Red Star’s United Republics of the Red Star (URRS) is a mythologised version of the real-world USSR circa 1980, but on a world where magic and spirits play a critical role. Before you read this profile, you’ll need to read the Maya Antares character profile (which explains magic) and the Guardsman Kyuzo character profile (which explains telekinesis). That way we only have to fully explain these things once. Real Name: Skymarshall Urik “Uri” Antares. Known Relatives: Marcus (Brother, reported deceased), Maya (Sister-in-law), Kazimir Antares (Father, deceased). Group Affiliation: Commander of the RSS Konstantinov. Height: 6’ Weight: 180 lbs. Modern Skyfurnaces are enormous flying combat-capable bases. They never land – magical suspension of the laws of physics can only go so far. A large one such as the RSS Konstantinov is nearly 3 kilometers long, weighs more than 300 kilotonnes, and carries about 20,000 in troops and crew. A standard infantry contingent for a full-strength Konstantinov would be 8 battalions of 600 men, 10 armoured columns with 25 vehicles each (mostly Hammer-class and Invasion-class super-heavy tanks, or “krawls”) and about 50 aircrafts. Plus the hundreds of hardpoints for air-to-air and air-to-ground combat. Since Skyfurnaces couldn’t exist without magic, they include a strong magical contingent among the crew. It takes specialised deck kasters to pilot a Skyfurnace. Beyond these witches, there is the usual complement of infokasters, medikasters, warkasters, etc. detailed to either the crew or the various ground and air units. A Skyfurnace the size of the Konstantinov carries a total of nearly 1,500 kasters of all sorts, about 600 of whom are deck kasters. The sheer size of a Skyfurnace also means hundreds of technicians and engineers, mundane and magical communication systems, supply depots, firefighters, high-speed railing for technicians to reach maintenance sites, specialised vehicles to move along the hull, boarding and counter-boarding structures, fuel dumps, kitchens, full medical facilities, barbers, waste disposal, etc. The power of the engines of a Skyfurnace is such that the most feared attack of such a ship is to ’go ventral‘. This means flying at a low altitude, then redirecting its engines at the ground and making a slow pass. The titanic columns of fire and thrust will crush and incinerate pretty much everything below short of a Hammer-class krawl. Skyfurnaces seem to be the core of the Red Fleet, the linchpin of Red military organisation. 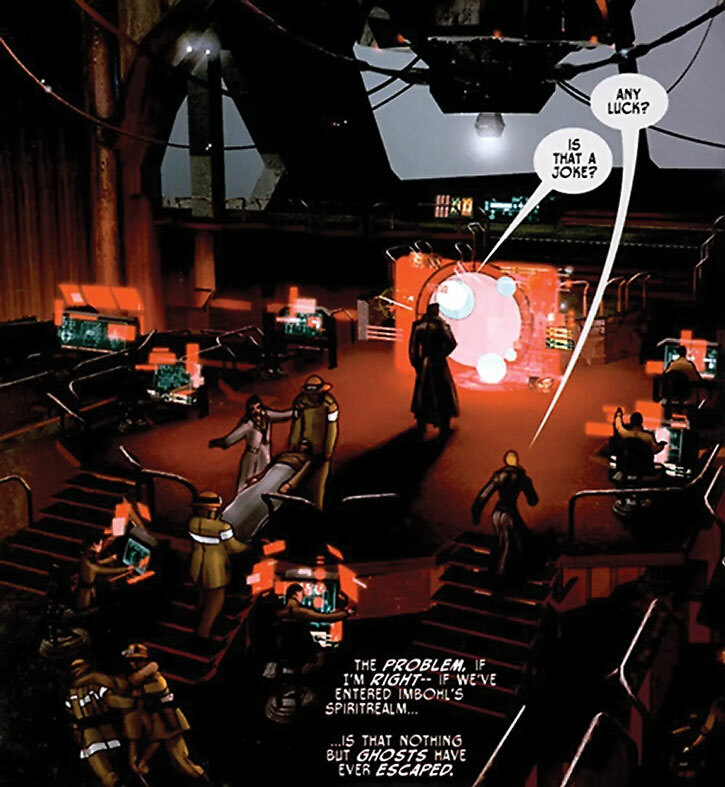 In the comics all units seemed to be attached to a Skyfurnace, but this maybe because the story takes place in one. The commander of a Skyfurnace (normally holding the rank of Skymarshall) is also the CO of all units aboard. There are specialised officers on the bridge for command delegation such as the Infantry Commander, the Krawl Drop Commander, etc.. These likely come from other branches of the service. A Skyfurnace is even more mobile than it looks. The specialised kasters aboard can cast major protocols such as jumpgates capable of teleporting the whole Skyfurnace. However, such a ritual takes hundreds of kasters coordinated via the Skyfurnace’s magical Informnet. And it will leave participants exhausted. If the Skyfurnace is not at full kasting strength (say, due to casualties among its witches) the participants will need to overkast. Such a sacrifice of life force that will result in wounds and even deaths. For more about Skyfurnaces and how they operate, see Green Ronin’s Red Star Campaign Setting . The RSS Konstantinov was likely named after Marshal Konstantinovitch Zhukov , who also was a historical figure in the real world. Urik Antares is a brilliant Red Fleet commanding officer. He was placed on the promotion fast track as soon as he graduated from the military academy, and was mentored by the famous Marshall Brusilov. Urik took the command of the RSS Konstantinov from his mentor. While the Konstantinov is not the most recent Skyfurnace, it was built to be the flagship of the Fleet and its construction remains exceptionally rugged. Beyond his talent for commanding a flying firebase crewed by thousands and carrying whole units of infantry, armour, witches, aircrafts, etc. Urik is notoriously charismatic and persuasive. Maya described him as having the charm of the Devil. This likely played a key role in his rapid advancement. He even persuaded his chain of command to play a bit loose with regulations, such as letting a married couple serve together on his ship. Antares’s reputation, charisma and style of leadership make those serving under him more loyal toward him then they are toward the decaying State. When asked to mutiny and follow their commander into an untenable situation for the greater good, an astonishing 70% of the thousands aboard the proud Skyfurnace Konstantinov said yes. Bring me my guns ! Urik is calm and determined even when faced with massive crises, and the sheer adrenaline from his responsibility let him ignore nasty-looking wounds to keep issuing orders. A fine Red soldier, Urik is in excellent physical shape and trained with all combat techniques, including Hooks (though he prefers guns). He is ambidextrous and usually fights with two handguns. Commanding officers of the Red Fleet wear a distinctive greatcoat. Senior ones (including some veteran Majors, but usually Lt.-Col. and above) often manage to procure an enhanced one. The main enchantment is an autoshield protocol. With one word this erects an invisible, ablative force field around the wearer. Autoshields can usually soak the damage from several bullets, and will slowly regenerate once dispersed by the accrued damage. Enhanced greatcoats also include minor protocols protecting against temperature extremes. It also seems that one pocket has magical holding properties – he can keep a half-dozen ammunition clips in it without encumbrance. For handguns, Urik has access to a pair of Model 79 Samsonov machine pistols. 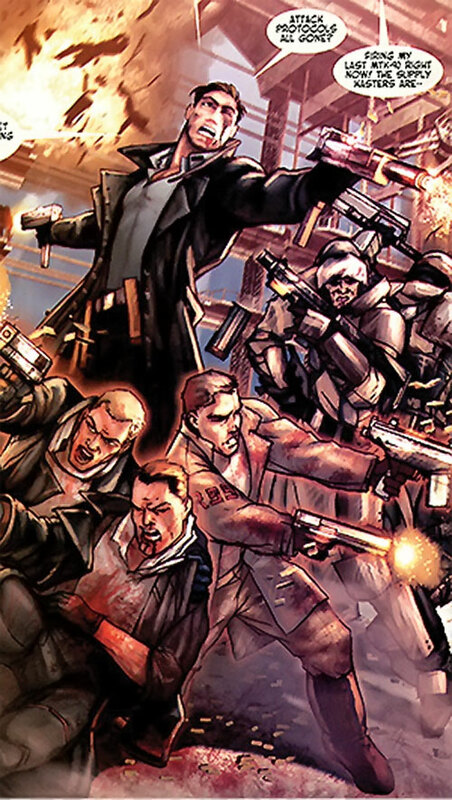 These are high-quality, protocol-powered machine pistols. Senior officers like Urik have a much easier time procuring them. Despite the high rate of fire and one-handed usage, 79s can achieve very tight bullets groupings. Urik’s guns are loaded using triple-protoclips. That is, the space inside these magazines is magically distorted to hold three times the normal amount of bullets. 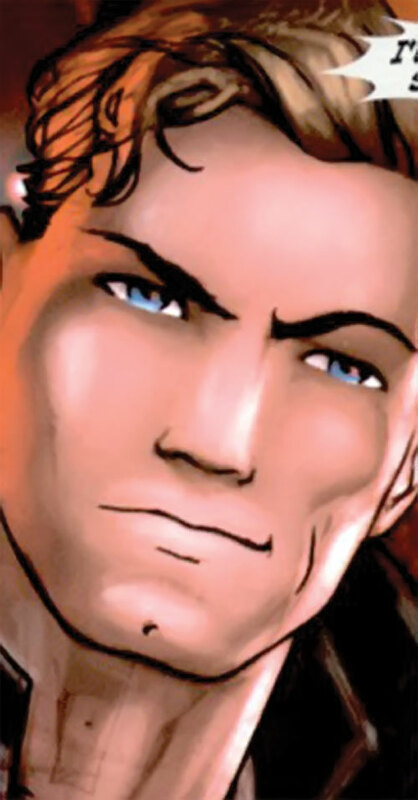 One panel notes that Urik Antares used to be a very powerful telekineticist and athlete. At the Academy he broke the engine pull record – engine pulling being a sport of sorts where a soldier combines his telekinesis and muscle to tow an enormous naval engine. 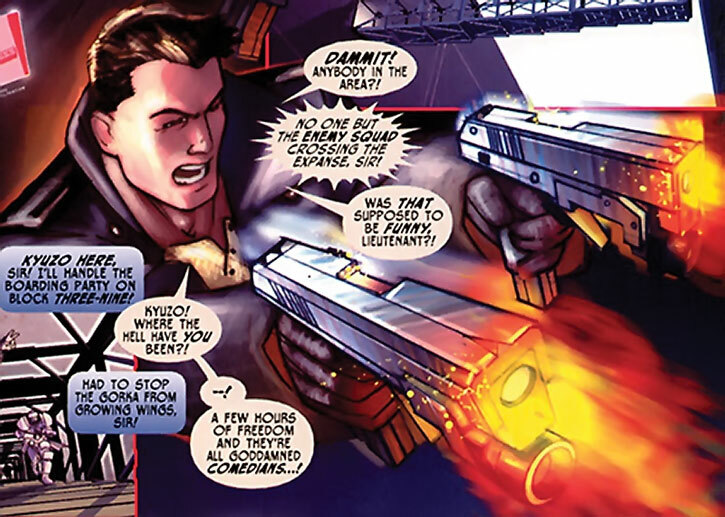 Since he prefers to fight with guns rather than a Hook and his telekinesis, this writeup (tentatively) assumes that he’s no longer a psionic powerhouse. As a Red Fleet telekinetic trooper, Antares is trained with the traditional weapon of the Fleet – the Hook. A Hook is a metallic polearm – a thick staff with a blade on each end. It is the symbol of the Red shock trooper. Though it would seem primitive, the best Red troopers prefer Hooks to guns. A Hook is telekinetically neutral, and a strong telekineticist can thus easily wield it with his mind. This allows the Hook to move with great speed, reach and power. When setting up a defensive rotation (with the Hook spinning in front of the wielder like a shield). When throwing the Hook away on an attack arc before it flies back. A Red trooper usually carries some pieces of kit to use his Hook as a compass, sundial, flashlight, splint or even cooking spit. After Al‘istaan, many Red troopers no longer have the training to be efficient Hook fighters – and many of those who insist on using a Hook would probably be better served with an assault rifle. Urik Antares knows that he cannot follow the training regimen of a true Hook fighter, and just uses guns – but if push came to shove he presumably wouldn’t fare badly in a Hook fight. Urik and Marcus are the sons of Antares, a great hero of the United Republics of the Red Star (URRS). 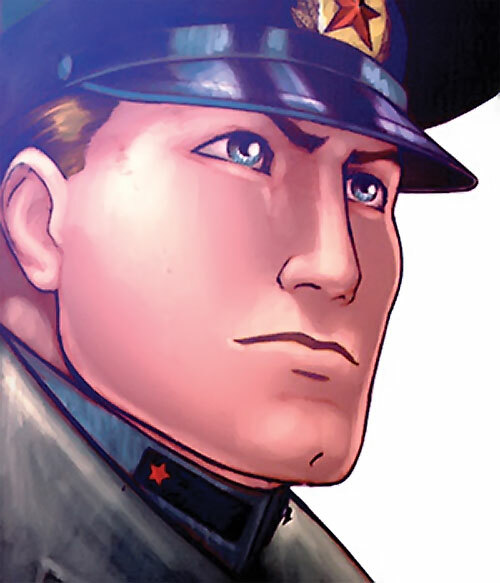 Antares fought in the Great Patriotic War , which in the Red Star universe seems to have lasted longer than in our own. The star Antares being a red giant, it is possible that “Antares” is a nom de guerre that was turned into a family name in recognition of service. Both boys were fervently patriotic. They intended to enlist at the prestigious Citadel Military Academy as soon as they were 13. Urik was a brilliant student and cadet, and ended up on the fast promotion track to become a Skyfurnace commander. After graduating he joined the staff of the great Skymarshall Alexei Brusilov. Brusilov commanded the flagship of the Fleet — the Skyfurnace RSS Konstantinov. 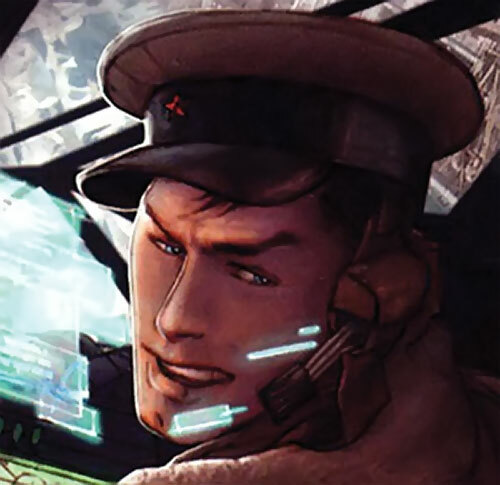 Antares was Brusilov’s protégé – in part because the older Skymarshall had served under Urik’s father. Uri intrigued to have his little brother, his future sister-in-law and their buddies from the Citadel Academy transferred straight under his command. Though this required bending a host of regulations, the persuasive Urik had his way after striking an unusual deal. He essentially bet that these young, brilliant officers could take on any mission. His chain of command took him up on that. High Command sent Urik and the band of lieutenants on a deniable, covert mission. The objectives were to recover a stolen prototype weapon and take out a series of stratospheric cannons that were a thorn in the Red Fleet’s side. Beyond his little brother and his sister-in-law, Antares conducted the mission with Cavalry Lts. Goncharova and Renko, plus Guardsman Kyuzo. The mission was a success, and Urik got his pick of the litter. The RSS Konstantinov was deployed during the long war in Al’istaan. It was in the thick of the catastrophic battle of Kar Dathra’s Gate. Though the Skyfurnace itself was not downed by the unprecedented offensive spell cast by the Nistaani shamans, a large percentage of its ground forces was destroyed. Though Cpt. Goncharova managed to get out of her smashed krawl alive, Marcus Antares was reportedly killed. Seeing the extent of the carnage, Skymarshall Brusilov evacuated as many Red troopers as he could. Kar Dathra’s Gate was Brusilov’s last battle. He was promoted up and away from field command — perhaps due to political pressures. Thus his second-in-command, young Urik, took the helm of the flagship. This prestigious promotion apparently sparked jealousy and resentment among some other Skymarshalls. The apparent death of Marcus devastated Urik and his friends. Though Skymarshall Antares ably took command of the Konstantinov, he became subject to discreet depressive episodes. Uri occasionally self-medicated with Citadel Vodka – basically pure alcohol. 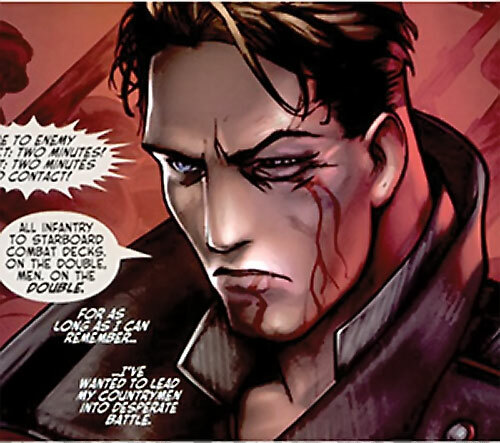 Urik also felt irrationally responsible for dragging Marcus after him into the military. He felt that his long-dead father would have blamed him. He also occasionally got into shouting matches with Maya Antares when their grief got the better of them, though they otherwise continued to work together without problems. Nine years after Kar Dathra’s Gate, the Konstantinov was deployed over another quagmire, the Nokgorka Secession War. Another ill-advised order from High Command resulted in the loss of several armoured columns for the Konstantinov. Cpt. Goncharova and Lt. Renko were killed in action. This hit Urik hard, and resulted in a near-breakdown for his sister-in-law, as Alexandra Goncharova had been her best friend since childhood. However, in the wake of these losses, a decades-long otherworldly plan fell in place. It would result in a desperate quest to save the Motherland – with Urik Antares at the helm. Like his brother, Urik is quite attractive. There is a strong family resemblance between them. He seems to smoke a bit, perhaps half a pack a day. Uri is first and foremost a leader. And commanding something the size of the Konstantinov means that he has to be on 24/7. He makes hundreds of decisions and gives hundreds of orders per day, including many calls he’d rather not make. Though he’s well-aware of his responsibilities and their implications, he deals well with the pressure. Uri doesn’t give in to routine and desensitisation. From time to time, he even manages to produce glimpses of the younger Urik Antares – the smirking, smooth-talking handsome rogue with his uniform in a very studied state of disarray. Unlike most Skyfurnace commanders and traditional Red officers, Antares cares for his crews and troops. Even the lowliest zeks (prisoners doing their time as military slaves). He will do his best to rescue beleaguered forces or diminish casualties. He has not hesitated to grant amnesty for their political crimes to zek units who performed above and beyond the call of duty. He will even do such atypical things in the Red military as to offer gifts (usually fine liquor from his own stock) to crew members who performed exceptionally. He trusts his command staff, which seems to have been hand-picked over the years. Urik is a patriot more than he’s a servant of the State. In this respect he seems to be patterning himself after his father the great war hero Antares. This also means that he wants his choice to be the ethical ones. 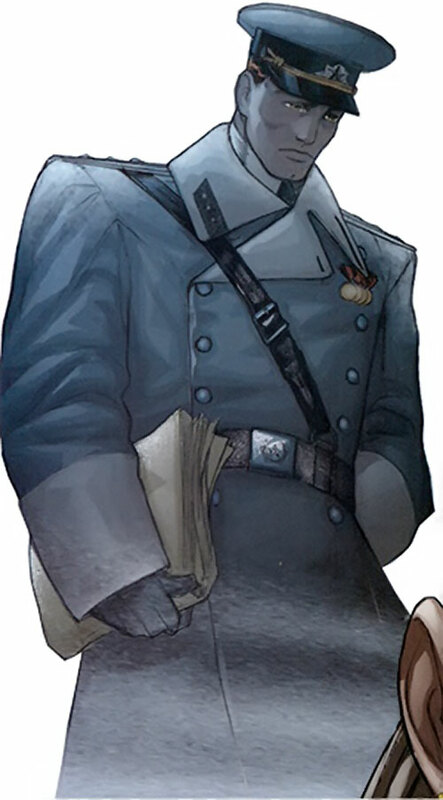 He also seems to have learned a lot from Marshall Brusilov – also a caring and free-thinking leader, and a good guy. Being inspired by the generation that fought in the Great Patriotic War, Urik still applies certain traditions that have fallen into disuse. One example is the Marshall’s Salute, where the commanders of two Skyfurnaces about to fight step out of the command deck and onto an external superstructure for a few minutes so they can see each other. Despite the tension of his job, Uri has a wry sense of humour. He will occasionally joke with his staff and friends. During severe crises his style of command soon becomes informal – Urik peppers his commands with profanities, fights alongside his troops and occasionally calls them by their first name for expediency’s sake. 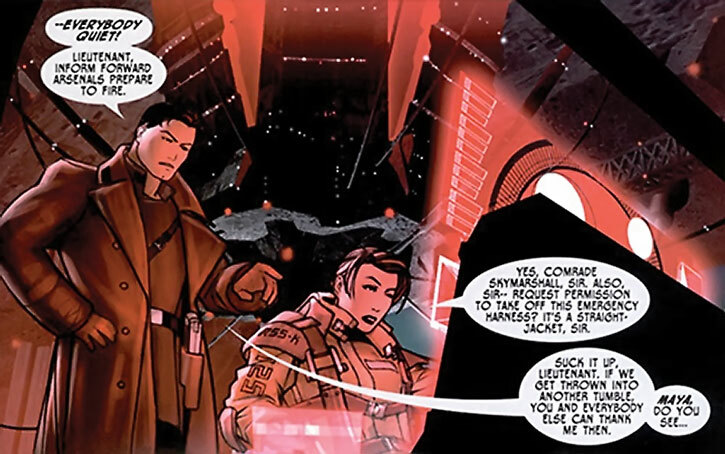 However, his obvious authority and competence inspire the crew and troops to fight and work harder as they listen to the litany of directives from Antares’s son and hear his strategy unfold. Urik is also very good at making off-the-cuff inspirational speeches when it’s necessary. Like with the rest of the gang, friendship is very important Urik. While he’s everybody’s commanding officer, he treats his friends as friends. Kyuzo prefers to remain a bit more formal than the rest, but this is a veneer. Urik’s friends are more likely to call him “Uri” than “Sir”. He has occasionally referred to his sister-in-law as his sister. Calling Maya his sister is a fitting description of their relationship anyway. There’s an ambiguity to Urik. He has always straddled between regulations and insubordination, and roguishly defined himself as an unconventional commander. While this presumably has been only possible because of who his father was — a clear privilege — he’s also genuinely and deeply driven to fill dad’s shoes as a larger-than-life hero and good man. Credentials (RSS Konstantinov, High), Expertise (Military equipment and procedures, Skyfurnace command), Gift of Gab, Rank (Skymarshall in the Red Fleet), Schtick (Paired firearms). Maya and the gang (High), plus military connections from his Credentials and Rank. SKYMARSHALL’S GREATCOAT [BODY 04, Cold immunity: 02, Damage capacity: 04, Fire immunity: 01 and a protopouch that can hold a half-dozen clips]. Model 79 Samsonov machine pistol (x2) [BODY 04, Projectile weapons: 05, Ammo: 08, R#02, Advantage : Autofire] and two or three triple-protoclips [Projectile weapons: 05, Ammo: 24, Limitation: Ammo clip for the Samsonov 79]. A person with the potential for strong telekinesis and proper training gains the Telekinesis (Hook) Power. 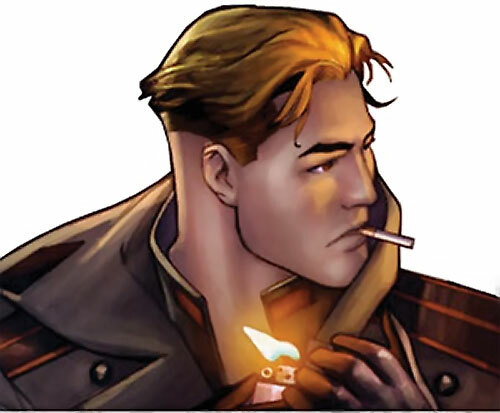 As noted in the entry for Guardsman Kyuzo, telekinesis in the The Red Star universe is not the Telekinesis in the rulesbook, and is best written up as a Power with diverse but specific applications. Telekinesis (Hailer) and Telekinesis (Hook) have been demonstrated. It is unknown whether a person can be trained in both. 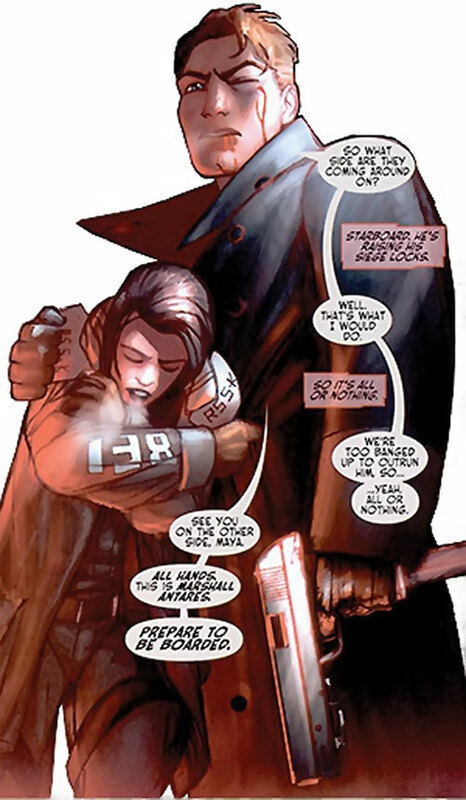 Telekinesis in the The Red Star universe is closer to the “tactile telekinesis” occasionally seen in comic books, rather than the ability to lift and energetically manoeuvre large objects at a range. Telekinesis (Hook) can work in a way reminiscent of the Martial Artist Skill, provided that the Character has a Hook. In any given Phase it can substitute for AV, EV, OV or RV. The last two are known as a “defensive rotation”, with the Hook spinning in just the right way to intercept attacks, up to and including bullets. This and Martial Artist cannot be used concurrently. Unlike Martial Artist, AV, EV, OV and RV from Telekinesis (Hook) for are considered to be the base score for HPs expenditure purposes and the Impossible Feat rule. They are not subject to specific limitations. Telekinesis (Hook) can retain control of the Hook at a distance, but with a -5 Special Range Penalty. By preparing and concentrating for a minute, a Character can add APs of Telekinesis (Hook) to their Strength (using AP maths) for a feat of strength such as grabbing and moving a heavy object. This is similar to power lifting, and the sort of things that can be attempted are usually along the line of events at a “strongest man” competition. In the hypothesis where telekineticists can remotely lift and displace objects with their mind (so far, there is little hint of this in the primary sources), a possible approach is to treat their maximum range as Telekinesis (Hook) with a -4 APs Special Range Penalty, and the maximum mass and EV as Telekinesis with a -5 APs Special Mass Penalty. If the mass is telekinetically neutral, the Special Mass Penalty is lowered from -5 to -3. Helper(s): Darci, and the Red Star sourcebook by Green Ronin. We’ve checked how canon it is with the fine folks at Green Ronin, who confirmed that all the material was from the notes of The Red Star author Chris Gossett – who also reviewed and approved the final draft. Writeup completed on the 23rd of December, 2010.